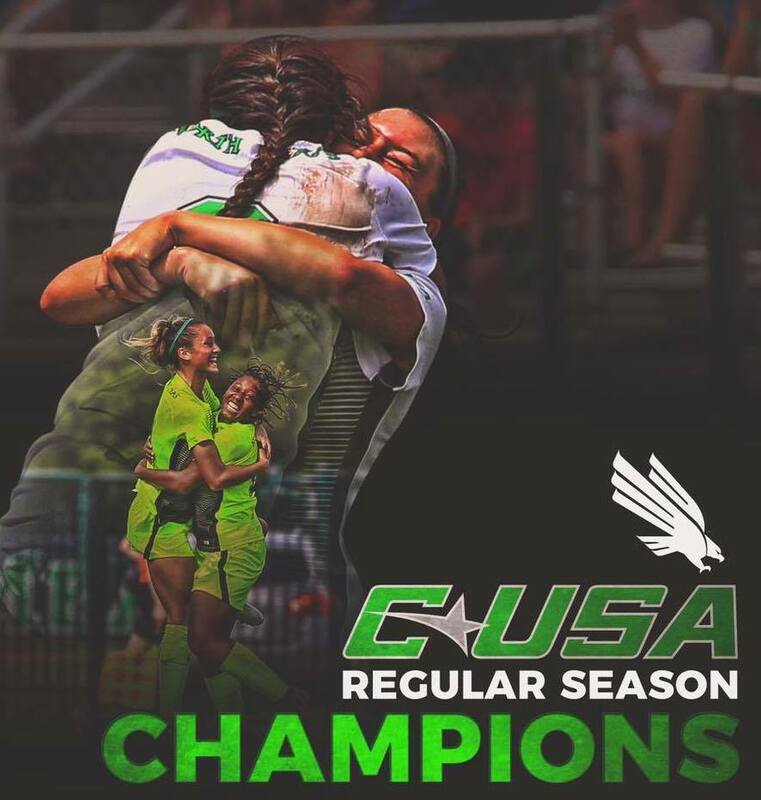 Aaliyah Nolan and her North Texas Soccer Women’s Soccer teammates claimed its 14th Conference Championship with a 2 - 1 overtime victory at Middle Tennessee. Senior Nolan scored the game-winning goal in the 102nd minute of the match from just outside the 18-yard box. She scored both goals in the match for UNT. "This is a moment I will never forget," said the 2017 Navarro College transfer. "I'm proud to get my second ring with this team and help the program win a conference championship for a fifth consecutive year. I couldn't do this all without my team and coaches behind me each and everyday." North Texas gave up a very early goal on Wednesday, just six minutes into the match, but held the Blue Raiders to just one shot in the final 48 minutes while its offense went on the attack. "First, give credit to coach Aston Rhoden and his team," Mean Green head coach John Hedlund said. "They battled us as hard as anyone we have played this year. I'm so proud of my team and our program. The women have been preaching Drive for Five since last spring and today they made it happen against an outstanding Middle Tennessee team." Nolan tied the match just four minutes after Middle Tennessee's goal and the team progressively came together to earn the game-winner. In the minutes prior to Nolan's game-winner, the Mean Green had a couple near misses that either were just too high or hit the crossbar. The opportunities were coming, it was just a race against the clock to get the goal. But it was Nolan's left-footed strike that finally beat the Middle Tennessee keeper. "I received the ball from Madeline Guderian and turned and aimed low," Nolan said. "To score a goal to win a championship is one of my proudest moments." With Wednesday's win, in what was a postponed match from a rainout in September, North Texas now has 25 points in the conference standings with one more regular-season match left on its schedule. Even if the Mean Green were to lose that match, the worst they could finish is in a tie for first with Florida Atlantic, which UNT beat on Oct. 19 at home. Also with the victory, North Texas clinched the No. 1 seed in the conference tournament, which begins on Oct. 31 in Norfolk, Virginia. By claiming the regular-season title, North Texas has won either a regular-season conference championship, a tournament conference championship or both, as they did in 2015, in five consecutive seasons.